If you've read any of my posts, you know I love to cook food I can freeze or turn into another meal later on. Time and money saving, at it's best. This meatloaf meets all my requirements. And it's delicious. 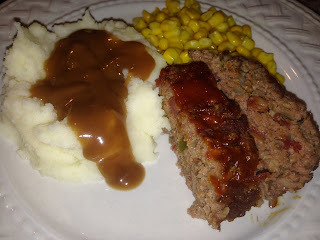 If you've been making meatloaf any other way, even your mom's recipe (like I have), you will ditch the old recipe. I have to give credit to Paula Deen, as this is where I got the recipe and for once, I pretty much follow it exactly. Except, when I am doubling it (or quadrupling it) I don't add as much tomatoes. 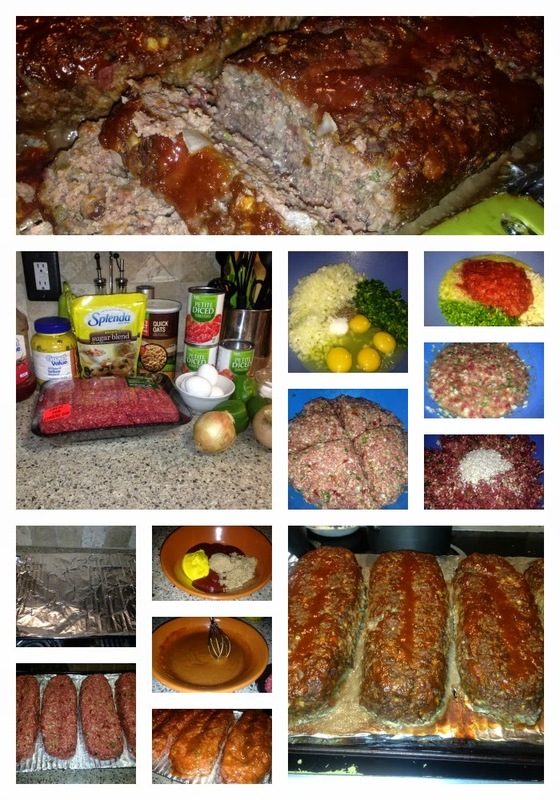 Most of you have probably made meatloaf so I won't try to reinvent the wheel and bore you with each step. I do want to share my tips, however. Firstly, I dice/mince everything pretty fine. My kids are veggies eaters, but green peppers aren't one of their faves so I make them as small as possible. Secondly, I mix all the wet ingredients in the bottom of the bowl then add the hamburger. I feel it helps distribute everything better. Thirdly, I break up the burger with two forks. Get it pretty mixed up before I use my hands. The warmth of your hands breaks down the meat and makes it more difficult to form. Fourthly, divide the mixture up into the number of loaves you are making while it's still in the bowl. That way, you have relatively the same size loaves and they will cook in the same amount of time. Fifthly, I don't use loaf pans. I don't like the idea of my food cooking in the grease so I form the loaves free hand on a baking sheet. PLUS, you get more surface area for this delicious glaze! BONUS! And lastly, I sit the loaves on top of a foil lined cooling rack over a foil lined baking sheets. Easy clean up! Bake the loaves for about an hour in a 375 degree oven. You want an internal temp of 160. If you want to cut your cooking time down, make smaller loaves. Individual loaves or pop them in a muffin tin. I freeze the cooked loaf. When I want to use it, I let it thaw in the fridge by taking it out the morning before I want to cook it. It freezes pretty solid so taking it out the night before sometimes left me with a partially frozen loaf when I was ready to reheat it. To reheat, I just cook the sliced in the microwave until heated through. 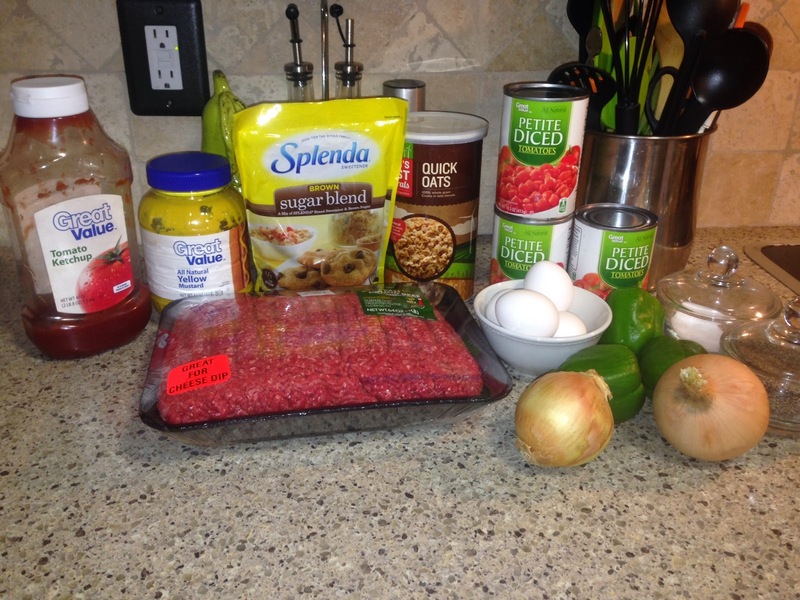 Combine meatloaf ingredients. Form loaf. Mix glaze ingredients in a separate bowl and spoon or brush glaze over top. Bake at 375 for about an hour. Disclosure: The content and opinions expressed here are all my own. You may copy recipes on to your own computer for personal use; however, you cannot copy this recipe in its' entirety and place on your blog without giving credit to The Nurse Mommy, creationofclay, and/or pouchfriendly. You may share recipes in email or IN PART on websites as long as credit is given to The Nurse Mommy as the author and provide a clickable or text link to the recipe on our blog, or a link to our homepage. You may not sell or charge for access for any recipes copied from this blog. 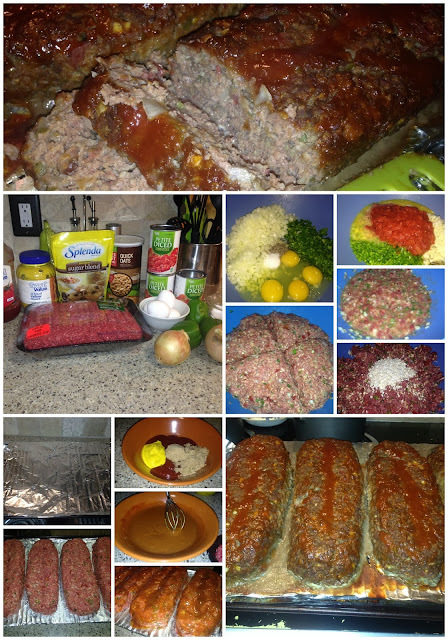 If sharing on Pinterest or other social media, please do not replicate entire recipe in description; please provide direct link to this post. Links above may contain affiliate links. This looks really good! I've never used oatmeal in meatloaf, but that would be good and add a healthy filler besides bread. I'd love to try this, I have extra oatmeal. 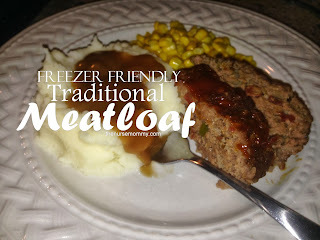 I like freezer friendly and there's nothing better than meatloaf, gravy and mashed potatoes - mmm!